Nellie & Phoeb's: All The Ranch! For those of you unfamiliar with the importance of Ranch Dressing in the Midwest, let me fill you in. OBSESSED, a lot of people are totally obsessed with this salad dressing and use it on a plethora of foods besides salad, like pizza, vegetables, chips, burgers, sandwiches, wraps, wings, french fries, chicken... etc. There are two types of people, there are the 'any kind of Ranch will do' kind, and then there are the 'I only like Mazzio's Ranch' kind. The latter will also pick restaurants based on how good their Ranch is, "Oh, they have good Ranch, let's go there!" Now that you get it, and I have positioned myself as an expert, when I say this is an excellent Ranch recipe, you know it's legit! It's also like super duper easy, so that's a plus. On a personal note, I fall into the picky group, I don't really care for any kind of bottled salad dressing at all. Sure, I buy it & consume it, but it's been because I felt like I had no other choice. Why in the world have I never considered making my own, I HAVE NO IDEA! Last week I saw an IG post of a friend that was prepping salad ingredients for the week, chopping different kinds of lettuces, cucumbers, shredded carrots, and cucumbers and bagging them in gallon zipper bags, and I had a huge light bulb go off, "I'm going to do that too and find a recipe for some awesome salad dressing!". I also bought shredded sharp cheddar, high quality bacon pieces, and croutons. You guys, this is like the Midwest comfort food salad, so good!!! We ate a salad before dinner, as dinner, or as lunch for the next 5 days. I was able to purchase a quart of buttermilk instead of a half gallon (did you know that it's a low-fat milk!? ), and went with Hellman's Mayo with Olive Oil (because it sounds healthier, ha) and I've seen several recipes that call specifically for this brand, also two packets of Hidden Valley Ranch Dressing Mix. Buy two because you will have enough buttermilk to make a second batch before the milk goes bad. 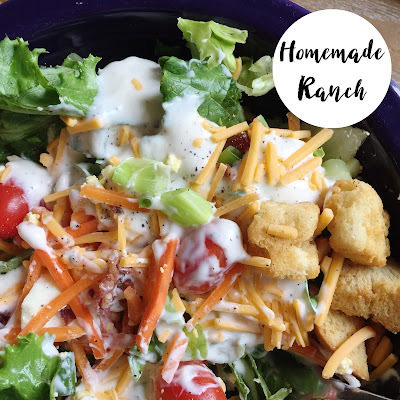 I found this recipe online, it was a screenshot image and was labeled Texas Roadhouse Ranch Dressing, not sure if it tastes like theirs or not but it most certainly tastes a whole lot better than any bottle on the shelf! Let me know how you like it and please share your favorite salad dressing recipes with me! I AM HOOKED on making my own! Mix all ingredients together and store in an airtight container in the refrigerator for up to one week. Cheers to my fellow Ranch fans!